It has long been recognized that teachers have ideas to help their students. From improving technology and workspaces to bringing in guest speakers and lending access to new hands on experiences – the sky is the limit when it comes to educational advances. In an effort to take those ideas to the next level, the Albany Area Education Foundation (AAEF) has been created and will kick off fundraising efforts with its first event, Purple Pride by Lakeside, in October. Stromme is a founding advisory board member of the AAEF, created by community volunteers in the Albany Area School District to expand opportunities for students. The foundation has been a discussion point for a few years now, inspired by other communities creating similar non-profit organizations, but until recently it had not taken full flight. Starting this past January, the advisory board was compiled and the AAEF became a Partner Fund with the Initiative Foundation. By creating this partnership, the AAEF has combined local knowledge and leadership with professional expertise and guidance to identify community needs, serve donors and manage investments. The advisory board includes co-chairs Daryn Lecy and Bob Gerads and members Steve Stromme, Kelly Bierbaum, Scott Buntje, Shanna Gerads, Jim Gondringer, Sonya Hoffarth, Greg Johnson, Jennifer Lecy, Lynn Pennie and Jill Seiler. Kim Lange is the foundation’s secretary/treasurer. According to its mission statement, the AAEF is an independent, non-profit organization devoted to supporting the continued excellence of Albany Area Schools. Partnering with the school district and the community, the AAEF secures private, supplemental funding to support district programs, spur innovation, and expand opportunities for students and staff in the areas of academics, activities, arts and athletics. The foundation’s vision is to expand opportunities for students by helping to raise funds to fuel school initiatives and programs. The foundation’s initial focus will be on developing an endowment fund, which is a charitable investment account in which the principal contributions will never be spent, but the earnings provide a flexible, dependable funding stream to support local students. As that endowment grows, the foundation’s ability to strengthen educational opportunities will grow as well. Create unforgettable learning experiences for students. Offer students rich, challenging, and engaging learning experiences that encourage them to be lifelong learners. Provide our students with world-class educational technology. Teach students how to incorporate technology in their learning, providing opportunities for student collaboration, critical thinking, communication, and creativity. Partner with community members to provide real-life, hands-on learning opportunities that teach vocational and life skills. Provide meaningful opportunities for students to prepare them to be contributing members of society (for example, Work-Based Learning internships, job shadowing, community experts). The specific grants that the foundation will award will depend on the applicant pool and the available resources in any given year. However, similar educational foundations have distributed grants to fund student scholarships; provide additional technology to enhance classroom experiences; and support learning experiences that extend beyond the classroom. Bob Gerads and Daryn Lecy shared the organization’s intentions with the school board on Sept. 13, expressing an initial goal of raising $50,000 in the first year. To start the fundraising efforts, the AAEF will hold its first event on Thursday, Oct. 26 at Fisher’s Club in Avon. 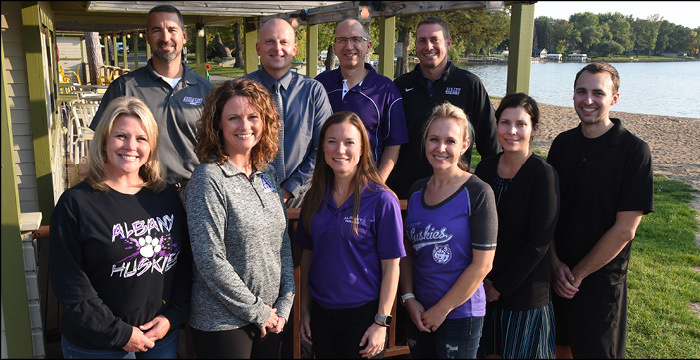 Purple Pride by Lakeside will include appetizers, dinner, live music and a silent auction. A limited number of tickets will be sold and are currently available at Stearns Bank in Albany, Central Minnesota Credit Union in Albany and Avon and at all school district buildings. Working through the process of creating the AAEF, the advisory board says the communities that make up the school district have embraced it. To contribute to the foundation quickly and securely online, visit www.ifound.org or contact members of the advisory board if you would like assistance with making a contribution to the foundation by mail or in your will.